Find out about hiring and licensing your scaffolding, plus building regulations and other related aspects. To hire scaffolding you’ll need to contact a scaffolding hire company. Your local council may have a list of approved hire companies. You should contact them to find out. You should employ a qualified builder or scaffolding company to carry out the erection of scaffolding, and a qualified builder to do related building work. It is the responsibility of the builder or scaffolding hire company to get a licence for any scaffolding that is put up on the highway (this includes the pavement). However it’s your responsibility to check they have this legal document and that it does not run out before the building work is finished. Contact your local authority to apply for more information about this licence. Scaffolding should be erected on a firm, level foundation. If there is a risk to the public, schedule scaffolding work for quiet times or get a highway closure your local council. It is dangerous to erect scaffolding too near power lines. Boards used should be British Standard BS2482. Strong barriers should be in place if someone could fall more than two metres. Avoid building waste falling on passers-by by keeping scaffold boards clear. Ladders should be strong, secure and in good condition, domestic ladders are generally not suitable. Heavy or bulky loads shouldn’t be carried up and down ladder. 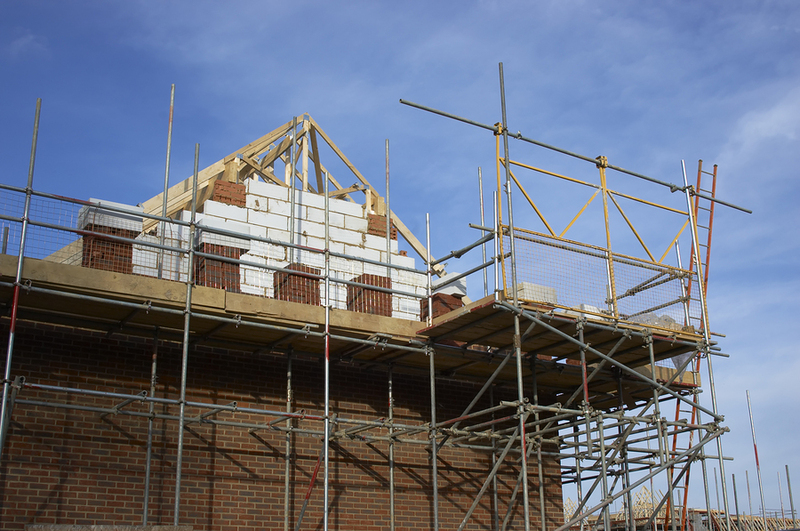 Scaffolding structures should be checked weekly, and inspected after alterations, damage and extreme weather conditions. Contact your local council for details of any building regulations you may need to consider, like the ‘materials and workmanship’ regulation or the ‘access to and use of building’ regulation. Copies of the current building regulations are available from Building Regulations Publications HMSO. You also need to make sure you have any necessary planning permission for the building project your scaffolding relates to. Your local council will be able to advise you on this. Including scaffolding, falls from heights are one of the most common forms of accidents. Every year this equates to nearly 20% of all workplace injuries. Falls result in approximately 80 fatalities and around 5,000 cases of major injury. These are all usually from heights of above 2 metres. The construction industry alone accounts for half of these incidents. It is estimated that the annual cost of accidents caused by falls is more than 300 million pounds. This includes personal suffering and medical costs, costs to employers, lost of output and damage to equipment. Determine and evaluate all the potential fall risks on site. Establish safe methods of work which are understood by all. Provide adequate resources to ensure safe working. Do not allow workers to work alone. Provide training and maintain training records for each member of the workforce. Implement an inspection regime which includes the appointment of a competent person to carry out pre-use checks, detailed and interim inspections. You will also need to keep and maintain interim and periodic records. You must also undertake periodic reviews of your systems and procedures.